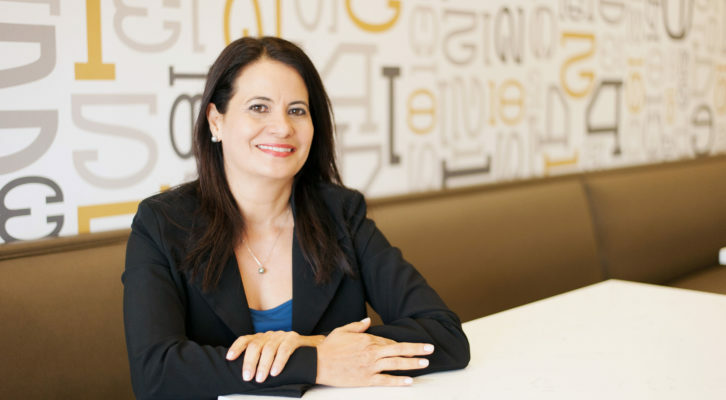 Alumna Arlene Johnston is co-founder of Burger 21, a popular and growing restaurant franchise. In 2009, after her twin boys Joseph and Jared were old enough to start school and her stepsons Robby and Ryan were away at college, Johnston and her husband Mark decided to expand his established restaurant brands and enter into the growing fast-casual restaurant segment. The American appetite for quality, creative burger flavor combinations was growing, and at the time, it seemed there was potential for a burger restaurant concept to do well. That year, the couple opened their first Burger 21 location in Tampa, FL, and set their sights on growing. 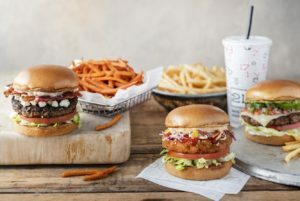 “Since there was experience with franchising a restaurant brand in the family, we decided to franchise Burger 21 after the successful opening of our first location,” Johnston said. Burger 21 offers chef-crafted burgers in a variety of flavor combinations. The menu features classics like the Cheesy and the Bacon Cheesy, made with 100 percent Certified Angus Beef®, cheese, bacon, lettuce, tomato, and their special 21 sauce, on a brioche bun. Then there are burgers that offer something a little different, like the popular Tex-Mex Haystack—a burger with applewood smoked bacon, onion strings, smoked Gouda, chipotle-jalapeño sauce, guacamole, lettuce, and tomato. In addition to beef burgers, that first store offered 21 chef-created recipes, highlighting a unique burger variety: turkey, chicken, seafood, and vegetarian. Other favorites are The Skinny and The Ahi Tuna burgers. The number of burgers has continued to grow as new recipes and seasonal burgers are introduced. They range in price from $5.79 to $9.99 depending on type and location. Today, Johnston’s twin boys are juniors in high school, and her stepsons help run their businesses. Burger 21 has grown to 25 locations in eight states, including two locations at Tampa International Airport. Their largest concentration of restaurants is in Florida, and they have 10 restaurants in development. As co-founder, Johnston’s day-to-day work involves managing the Burger 21 franchisee committee and the brand’s annual conference, which provides franchisees with education and insights on achieving success with their restaurants. She also oversees strategic planning and goal-setting for the burger brand, as well as for Grillsmith, a group of Tampa casual restaurants offering American comfort dishes, where she serves as principal. 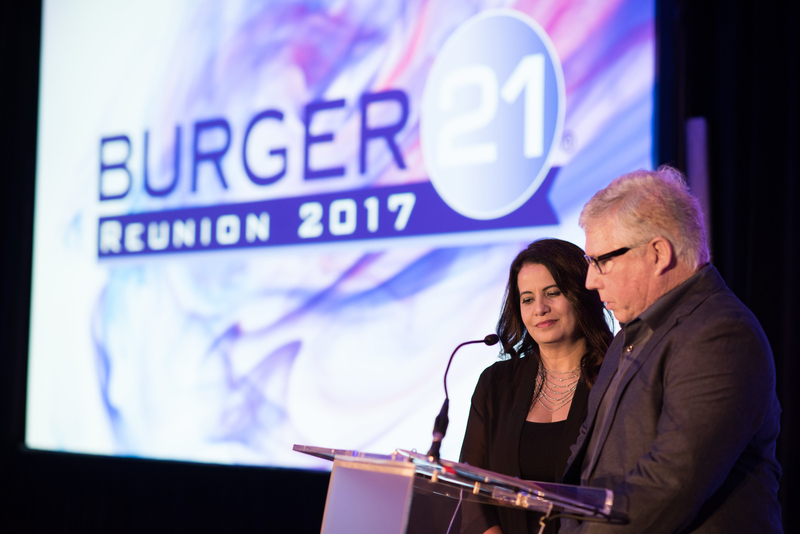 Alumna Arlene Johnston and her husband, Mark, present at a Burger 21 brand conference for franchisees. While some may say she has achieved remarkable success, Johnston points out that career success is only one part of the equation. In her opinion, true success should not be measured solely by monetary means. For Johnston, building strong relationships with the people in her life is incredibly important. Her advice for those looking to advance in their careers is to treat everyone with respect and demonstrate respect in all aspects of life—from how you park your car to the cleanliness of your desk. She advises maintaining a humble spirit and checking egos at the door. Another important piece of advice from Johnston: never assume you are supposed to know everything. Johnston recommends reaching out to others who are experts in their fields to gain additional knowledge and insight before making important decisions. “Making a rushed decision, which results in the wrong choice, in my honest opinion, makes you lose credibility as a knowledgeable and competent professional,” she said. The importance Johnston places on respect and relationships translates into her personal life as well. She wanted deeply for her sons to have a worldly upbringing and made it a priority to introduce them to different cultures and languages. 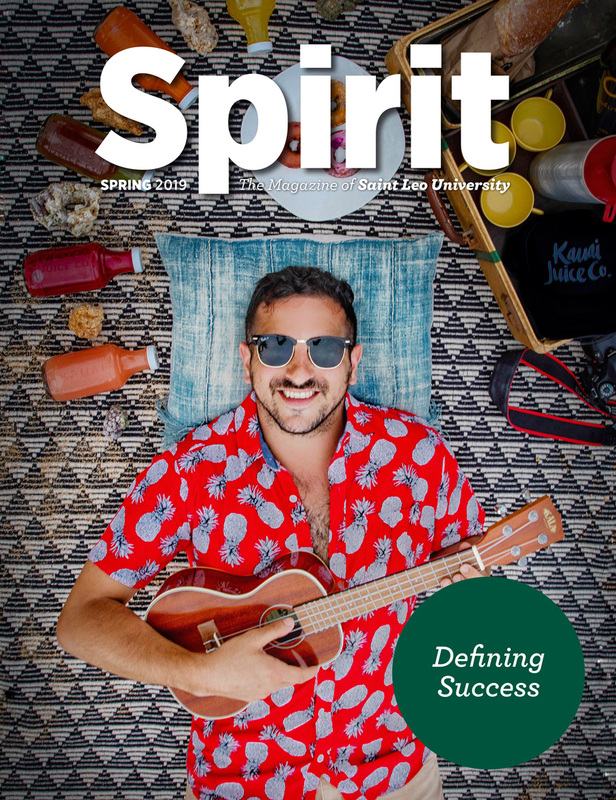 Through this exposure and their hard work, they are fluent in three languages—English, Spanish, and French—and have unique experiences that help shape how they approach life. “My biggest accomplishment is becoming a mother of twin boys, who are now 17, and teaching them about life and the world,” Johnston said. 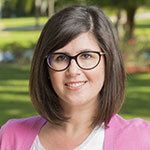 Johnston moved to the Tampa Bay area 30 years ago from her home in Puerto Rico to attend Saint Leo University. She had learned about Saint Leo from friends and enrolled in classes at University Campus. 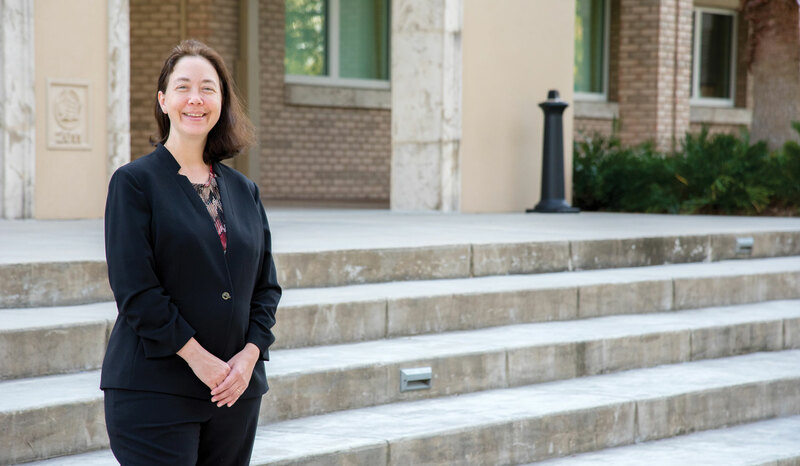 However, after securing a full-time job at a hotel in Tampa, Johnston took her remaining classes at the education center located on MacDill Air Force Base. She earned a bachelor’s degree in business administration. 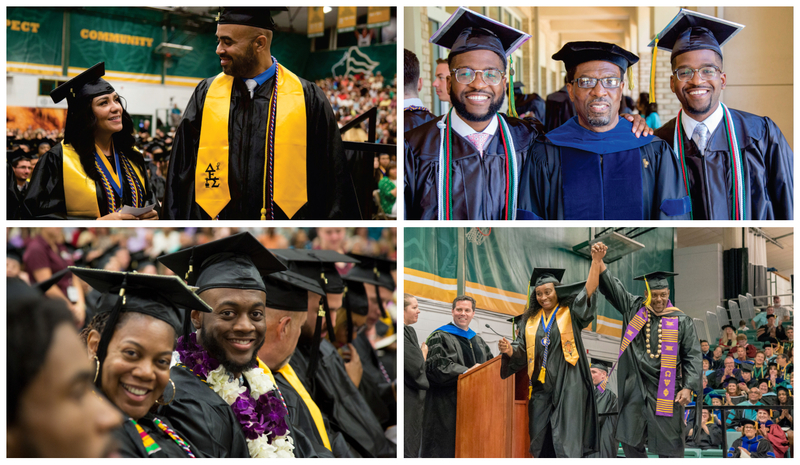 Johnston admired the spirit of togetherness that existed throughout the university community. She recalls how everyone was always willing to help one another. 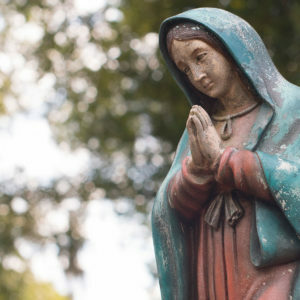 Saint Leo’s core values still resonate with her.